In the modern world less and less people have a desire to be subject to someone. Relishing a wide range of available internet technologies and smart tools, open source platforms, etc. they try to start their own online business, offering a range of products and services. One of the most popular options is the creation of an online store. But in this case it’s a must to have in mind that it’s impossible to do e-business and carry on ecommerce without dealing with online payments. Nowadays, banks and numerous payment platforms offer integrating shopping carts and payment gateways in a variety of ways. However, when you start to work with money directly you should understand the risks you take. Without any doubts it’s hard to imagine an online store where one has no possibilities to make a purchase and an online payment. In any way, a customer is to be redirected to one or another payment service provider. 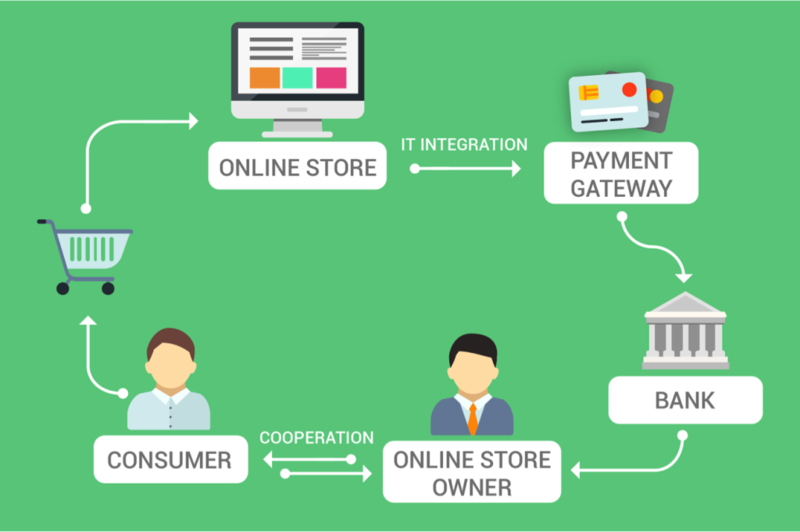 The most important thing for an online shop owner is to understand which payment gateway to choose and how to integrate it securely to win users’ loyalty and contribute to a considerable increase in sales. What are the most useful payment gate integration tips? First and foremost, give preference to those providers that allow adjusting the design of shopping carts and payment gateways. As we know, a great number of headlines features users’ personal data leakage or bank cards information theft. Unfortunately, there are no 100% safe ready-made programs and there’s always a risk to face a theft, hacking or leakage. Apart from obvious tips, like using really secure providers, it would be nice to adjust the payment mechanism in the following way: make sure your online shop doesn’t store any personal data, let a gateway deal with that. Your data bases should contain neither users’ bank account details nor social networks info that is entered by the customer during the registration process. On one hand, you jeopardize the service level but on the other hand you avoid the risk to be hacked and have your data bases stolen, which is much worse. The only thing you have to make available for customers is their detailed purchase history. Your purchasers don’t want to waste much time browsing an online store, so, give them a possibility to buy the same products within the course of time via saved templates. Furthermore, another of the useful payment gateway tips for promising businessmen is to do back-ups. Use the secure payment gateways integration. For that you will need a couple of different gateways to feel comfortable in case one of them fails to function. If you serve many customers all over the world, especially at a time, it’s hard to avoid glitches and the situation when one or another gateway provider is unavailable for various technical reasons. Buyers will hardly come back to your online store to make sure the payment provider started working, so, keep in mind another payment service you can use if there are problems with the main one. Authorize.net is one of the mostly widespread payment gateways that gained confidence of such giants as eBay and Flagship Merchant Services. The platform receives payments via credit cards, e-checks and alternative payments. The easy process allows the customer to make a secure payment and purchase the product in just few minutes. PayPal is another popular payment gateway that has been functioning since 1998. It accepts credit and debit cards. Another feature is that your customers can deliver checks via their device’s camera, and purchase a product right on your website. First Data Corporation provides really top-notch services, accepting credit, debit, gift cards, and some other prepaid card offerings. But to relish this payment gateway benefits (among which is also security) you should be willing to plough money as other 6 million merchants that take advantage of this provider. Dwolla has its own perks. This payment gateway transfers funds via email, a mobile phone or social networks. Additionally, it charges no transaction fees, delivering secure and fast services. PaySimple is an attractive option for small-and mid-size online shops. Taking security soberly, the gateway welcomes e-checks, credit and debit cards. PaySimple also provides customized reporting and secure payment storage to have a chance to repeat transactions without wasting much time. Intuit is always in the Top-10 of all the payment gateways overviews. Being easily integrated with your website it can also boast low transaction fees. Intuit is an optimal solution for items with an average turnover. 2Checkout.com started its existence in 1999. This payment gateway is willing to accept payments via credit and debit cards, PayPal. 2Checkout.com has won loyalty of vendors and users in 196 countries thanks to its security, simplicity and the absence of setup and monthly fees. Paynova is the right fit for your small business. Being launched in Sweden, this payment gateway with a secure interface serves not only in Europe, but helps online retailers around the world. Thanks to Paynova, traders obtain access to 21 payment options, including credit and debit cards, internet banking, and multi-currency. The gateway also supports an array of languages. ChronoPay is another European payment gateway (this time from the Netherlands) that allows online shop owners to receive payments via bank cards (VISA, American Express, JCB, etc.) and with electronic cash. ChronoPay’s peculiarity is the support of 158 currencies. Moreover, this gateway may gain merchants’ confidence by the fact that it provides assistance to nongovernmental organizations (Greenpeace, WWF, UNICEF) with charitable funds, accepting donations on their own resources. Fastcharge.com is another option for start-ups and small businesses with a limited budget. You can install it for free, but will have to pay a $10 monthly fee. Fastcharge.com serves about 5,200 shopping carts and accepts credit cards. Taking into account the abovementioned info, make sure you choose the best type of a gateway and use the secure integration when you start your personal online store. Moreover, think of the safety of users’ personal data and adjusting payment mechanisms in the best way possible, considering one or another payment gateway from our Top-10 list.